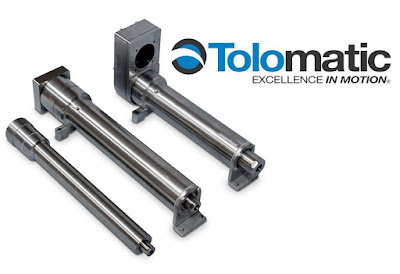 The Tolomatic ERD hygienic all-stainless-steel electric cylinder features a new roller screw option that increases the maximum thrust to 7868 lbf for expanded cylinder life and improved performance in high duty cycles over ball screw models. Tolomatic's ERD hygienic cylinders are IP69k-rated and are available with strokes up to 16 inches and speeds up to 22 inches (559mm)/second. They are ideal for clean-in-place operation as they can withstand high-temperature and high-pressure washdowns. The smooth body hygienic design eliminates the need for actuator guarding fixtures, which simplifies machine design and lowers costs. ERD hygienic actuators are compatible with a variety of third-party stainless steel and white paint servo motors, creating a flexible, clean-in-place, electric linear motion solution. Motor mounting can be in-line with the actuator or in a reverse-parallel configuration that reduces overall length and allows for near pivot mounting. Models are shipped built-to-order in around 15 days. For more information, please contact C&E sales at 800-228-2790. Thank you!